The 2019 Rock Showcase embodied the spirit of rock n’ roll Saturday night with crunchy guitars, powerful vocals and in-your-face stage presence. Country rock outfit Our Brother George opened the showcase with lead singer Henry Long’s soft electric piano sounds and raspy vocals front and center. The band’s sound was cohesive and full, with a solid rhythm section and fantastic tenor sax solos. The band’s three-song set included its latest single “Patio Bar,” and a cover of Chris Stapleton’s “Midnight Train to Memphis.” With clear 70s influence, Our Brother George’s mix of soul, hard rock and country was a more traditional and old-school sound compared to the rest of the acts. Our Brother George was followed by YSA, the stage name for songwriter Ysa Fernandez. The artist’s more jazz-oriented sound served as a great change, and Ysa’s sultry vocals stuck out perfectly in the mix. However, Ysa’s clear and clean guitar tone meshed oddly with her lead guitarist’s tone, which sounded muted and out of tune in comparison. A cover of Dua Lipa’s “New Rules” closed out the band’s pop-influenced set. Adopting a more electronic and indie sound, ENZI’s top-notch production and the dynamic stage presence from lead singer Makenzie Culver made the band’s set one of the most energetic of the night. 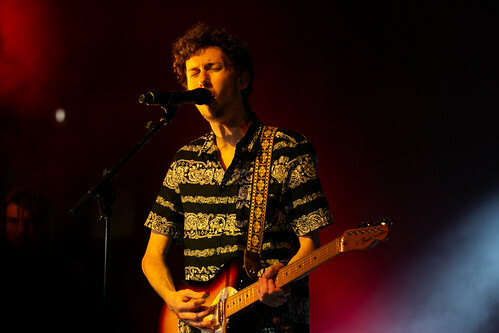 The original song “Flipside” and a cover of “Heathens” by Twenty-One Pilots showcased Culver’s powerful vocals and unique stage persona. The final band of the night, Lemondrop, opened its set with a driving and hard-hitting cover of Harry Styles’ “Kiwi.” Issues with audio distracted from the set at times, as one of the rhythm guitars wasn’t audible until the second verse, where it cut back in suddenly. With a sound akin to Paramore and old-school alternative groups like The Cure, Lemondrop’s sound was heavy on guitar, bass and drums. Lemondrop walked away with the win at the end of the night, but Our Brother George’s performance was the strongest overall, and both groups are ones to keep an eye on going forward. Photos by Carina Eudy, Megan Garvey and Colby Crosby.